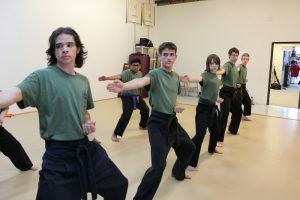 East Valley Martial Arts Dojo facility is over 2,000 square feet. There is a waiting area in the mat room where you can watch class, as well as an additional adjacent waiting area where family members can relax. Our padded floor takes up 90% of the mat room and is cleaned and sanitized weekly. We have a restroom and small pro shop. We have heavy bags and punching dummies, and various full-size, focus and hand-held targets. For specialized weapons training, padded safety weapons are available. Snacks, cold drinks and water can be purchased, although we do have a drinking fountain as well. Please feel welcome to call and set up a time to stop by, meet us, check out out the dojo and watch a class!